In early October 2017 we posted about Nanotech Engineering's novel graphene-enhanced solar panel, a post that raised many eyebrows. Nanotech says that their graphene panel reaches a 92% efficiency (compared to around 20% for large commercial silicon-based PV panels), and the cost per Watt of their panel will be 0.55 cents (compared to a US average of $3.26 for silicon PV panels). Our post quoted Nanotech's PR, stating that Jeffrey Grossman, Professor of Engineering at MIT verified the technology and said that “Pound for pound, the new solar cells produce up to 1,000 times more power than conventional photovoltaics”. So first of all, Nanotech's panels are reportedly built from ten layers of graphene and a carbon nanotube forest on top. The CNTs convert the photons to electrons while the graphene is the conducting layer. The company says that this structure enables the high conversion efficiency - while still being very cost effective. Our readers pointed out the Schockley-Queisser limit - according to research the maximum theoretical limit of PV efficiency is 86.8%. Nanotech, however, says that this limit is only applicable to Silicon, but for Carbon Nanotubes and graphene it does not hold. Regarding MIT, Nanotech admits that this was a mistake. The original post came from their advertising company which made a wrongful statement. Nanotech later removed that article and post. The quote from MIT was correct - but it had no relation to Nanotech's technology - it was about graphene solar potential in general. Nanotech posted the technical specification of their panels - actually stating that the cell efficiency is 96.9% and the module efficiency is 94.7%. These results are from the company's own testing, and it has signed up for a third-party test by Intertek which will inspect the panels and provide its own results. The Intertek results are expected within a few months. Towards the end of 2017 Nanotech received its first panel samples, and posted the video you can see below. Finally, the company updated us that they are currently in the process of finalizing a financing round, which they hope will bring in $30 million to enable them to commercialize the panels. 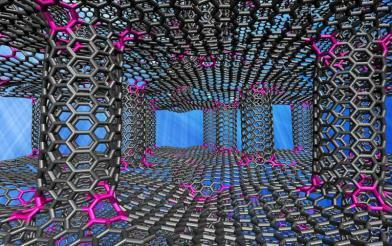 Nanotech is also looking into other graphene applications, including composite materials. will this save the biosphere? This technology breakthrough appears to be our only real chance and relies on a deep secret of physics that nevertheless is solid science. Ecological crisis is much worse than is reported in the media - with Dr. Natalia Shakhova exposing the ESAS methane "bomb" and the Global Dimming Effect - we need a massive energy conversion, very soon - within five years at the most. thanks. Ditto. Did you go thru the presentation? The biggest challenge I had was believing that such a radical leap. They even show someone comparing the volts and amps from their small panel outputting as much as an off-the-shelf panel that is 10 times bigger. I was also approached about an investment. I like the solar energy industry and I like nanotechnology. I'd like to know if the efficiency and costs are real. Their PPM is substandard, especially the financial projections. I want to know their plans and costs for production as well as costs to take the product to market. The PPM tends to assume they can capture as much market share as they want as fast as they want. However there are significant costs to ramp up and support all/some of the market. It's worth doing more research! It looks a scam to me. It looks a scam to me. National average for silicon panel is .6 cent not $3.25 per watt. Their production cost is .55 cent, so they can not sell at $2.5 per watt. Also, their technology has not established yet. Even a simple google search proves you wrong. Cost per W of solar is over $3. Price for non-solar is much less. Not per panel. It’s for an entire installation. Panels cost usually $150-225 for 300 Watts. So $.50-.70 a panel. In 2013 a company known as HHO HOME HEATING SYSTEMS BV (Netherlands) showed a Plasma Steam Heating unit that used only100mls of water and 1.4kw a hour and would save 75% on heating bills. They had published patents. Their website is now gone. Now we come to Nanotech Engineering Inc and their NANOPANEL. In their video on their website the bald man with pointy ears states that they are patent protected, which is not true, only patent pending, maybe. Also the third-party test by Intertek, which was to take place in early 2018 which never took place as far as my research has shown. There are to many Red Flags, really looks like a scam, unless more proof is shown by this new company. Think about it ! Christopher Styga, a NYC researcher of HHO and SOLAR Breakthroughs. Ive been researching rectenna type pv cells and even they have certain inherent problems that limit their efficiency to less than 50 percent.They have to demonstrate their panels. until they do they are frauds in my book. I have seen their Patent Pending, my understanding was that Patent Pending are the precursor to full patents and not published. I'm not a patent expert though, but saw that it was filed. Dear John, Could you tell us where you saw information on Nanotech Engineering's Nanopanel™ patent pending.You can only use the patent pending notice after your patent application is complete. If you state, "patent pending" before you have applied for a patent, you are committing fraud on the Patent Office. This comes with fines of up to $500 per case. That fine can add up quickly when dealing with high-volume goods. You meant 0.6 dollars, not cents. Contacted Intertek today 1/24/2019. Asked if they were ever contacted by Nanotech Engineering to review their Nanopanel TM. They checked their data base, and found nothing. Unless someone else has some other information to the contrary, you can take this to the bank. Retail versus wholesale Right now a standard 310W panel installed with everything runs about $3.30 to $4.25 W depending on the company installing it. The all in cost wholesale including inverter technology and racking is around $.99 to $120 Depending on the product. Their manufacturing cost could be easily offset by the concentration, you need a lot less of them for the same output of energy, since they take a lot less space. Could be a huge game changer. I just looked it up. The national average is 3.26 as stated. Anyone invested and received monies yet?